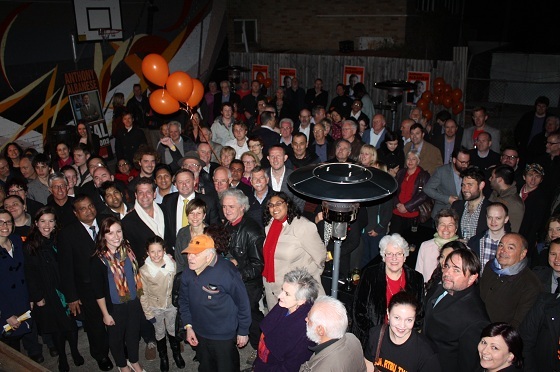 Deputy Prime Minister and Federal Member for Grayndler Anthony Albanese last night launched his campaign in Enmore with over 200 supporters and special guests actor Rhys Muldoon and ALP National President Jenny McAllister. Mr Albanese said the contest would be tight both nationally and in Grayndler but he was confident he and the Government would be re-elected. “Labor has a positive vision for the future,” said Mr Albanese. “We are taking action on climate change, increasing school funding, delivering DisabilityCare and rolling out the fibre-to-the-home National Broadband Network. “We have done this while keeping the Australian economy strong through the global recession. “We have kept unemployment low by investing in infrastructure across the country. In Grayndler, we have upgraded school facilities, revitalised the Cooks River and invested in the Ashfield Civic Centre, Fraser Park, the Italian Forum Cultural Centre, Leichhardt Oval and Mackey Park. “Nationally, we have invested more than $60 billion in Australia’s road and rail infrastructure, including more in urban public transport since 2007 than the combined total of every previous Federal Government since Federation.